30 | TH E M R EP O RT FEATURE The American Mortgage Diversity Council (AMDC) is a member organization focused on shaping the diversity agenda while advancing solutions that support a broad range of diversity initiatives. 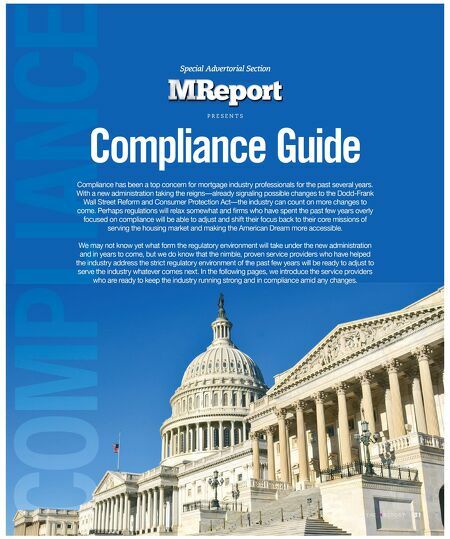 From compliance to Section 342 of Dodd-Frank minority and inclusion rules to the recruitment and hiring of a diverse leadership workforce, AMDC takes on today's issues with refreshing perspective and meaningful insight. Become part of the growing number of companies and individuals who are standing up and promoting diversity in and across the mortgage industry. 2017 MEMBER COMPANIES A&D Property Services | Accumatch | Altisource | Armor Concepts | ASONS | Aspen Grove Solutions | Asset Valuation & Marketing | Bank of America | BankUnited | Beers Housing | Capital One | CastleOak Securities | Consolidated Credit Solutions | Egan and Alaily | Fannie Mae | Federal Home Loan Bank of Chicago | First Allegiance | First American | Freddie Mac | Futura Title and Escrow | Global DMS | Heavner, Beyers & Mihlar | Hudson & Marshall | Independence Title | Johnson, Blumberg and Associates | Landmark Network | LoanCare Servicing | MERSCORP Holdings | MetroCorp Claims | MLG of California | Mortgage Connect | MSI | National Tax Search | Nationstar Mortgage | Ocwen Financial Corporation | Orlans Moran | PennyMac | Precedent Management | Property Masters | Quintairos, Prieto, Wood & Boyer | Richard M. Squire & Associates | RUTH RUHL | ServiceLink | SHD Legal Group | Stern, Lavinthal, & Frankenberg | Sutton Alliance | Ten-X | Truly Noble Services | U.S. Bank | Van Ness Law Firm | VRM Mortgage Services | ZVN Properties American Mortgage Diversity Council* Where Diverse Groups Share Common Goals. 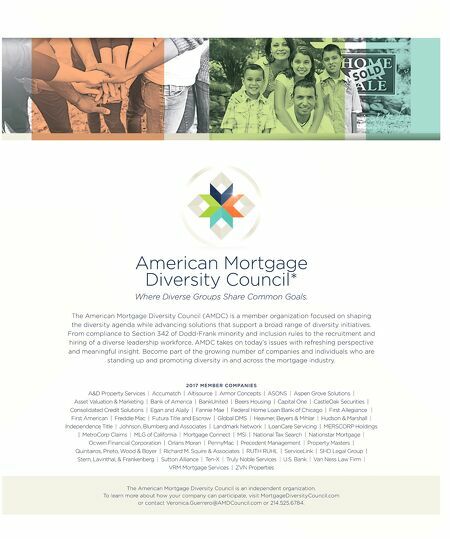 The American Mortgage Diversity Council is an independent organization. To learn more about how your company can participate, visit MortgageDiversityCouncil.com or contact Veronica.Guerrero@AMDCouncil.com or 214.525.6784.